Leaning on a farm gate along River Bridge Drove, on the western edges of Tealham Moor, and – inevitably – becoming the centre of attention. I’ve processed this to bring out detail, and can’t help but see some traces of bewilderment – and perhaps despair too – in this face. But then, I eat meat, and it would certainly be wrong to pretend otherwise. Technique: X-T2 with 55-200 Fujinon lens at 300mm (equiv); 3200 ISO; Lightroom, using the Velvia/Vivid film simulation; Silver Efex Pro 2, starting at the Full Contrast and Structure preset and adding a light coffee tone; River Bridge Drove, southwest of Westham, on the Somerset Levels; 22 March 2019. 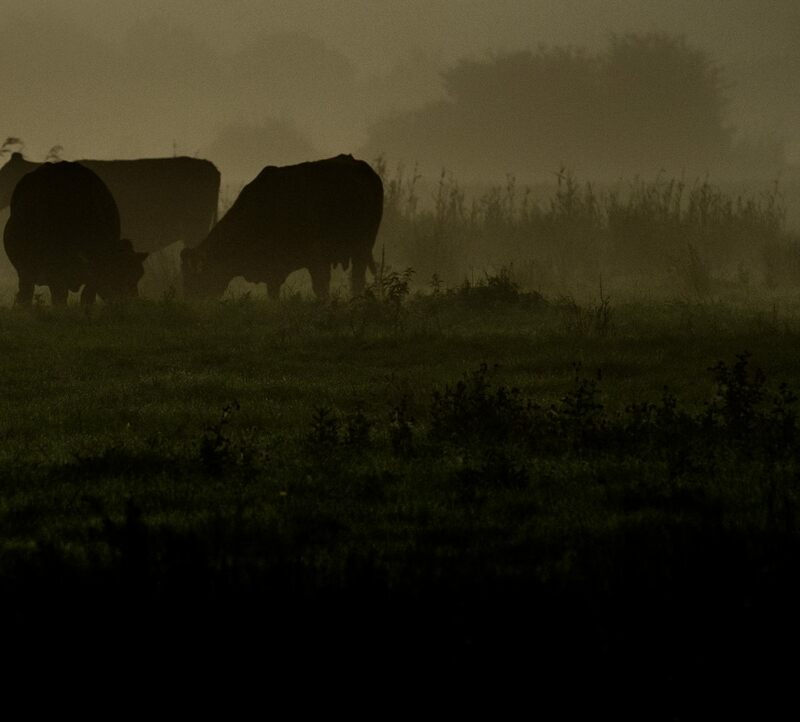 Cattle grazing at sunrise: a scene that was almost silent, save for the animals’ faint shuffling, and the subdued sounds of birds, running water and a light breeze. There are many features in common throughout the whole area; the quiet scene of grassland and cows, rhynes and pollarded Willow trees, windbreaks and thick old hedges and dead straight roads and droves. All seasons have one important factor in common, that is a peaceful scene with very few people in it, no summer crowds and no traffic clogging the quiet roads. … a scene that was almost silent, save for the animals’ faint shuffling, and the subdued sounds of birds, running water and a light breeze. There are other images from this early morning shoot here: 1 2 3 4 5 6 7 8 . Technique: X-T2 with 55-200 Fujinon lens at 106mm (equiv); 200 ISO; Lightroom, using the Provia/Standard film simulation; Tadham Moor, on the Somerset Levels; 19 Oct 2018. 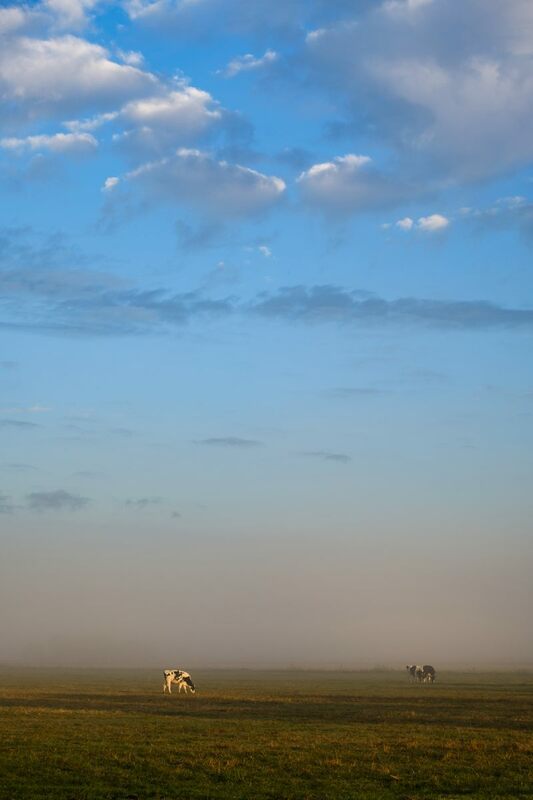 I lived in Kenya and loved the huge, towering skies of Africa. Nearly 30 years ago (time flies!!! ), I returned to the UK and have become (more of less) used to living here once more, although not subscribing to or believing in some of the things that seem to make modern Britain tick. But I’ve never lost my memories of those tall African skies, and the wide open skies above the Somerset Levels always remind me of them – and especially those over the Tadham and Tealham Moors, which I never tire of visiting. This picture looks west over the rough and often untidy pasture of Tealham Moor at sunrise. 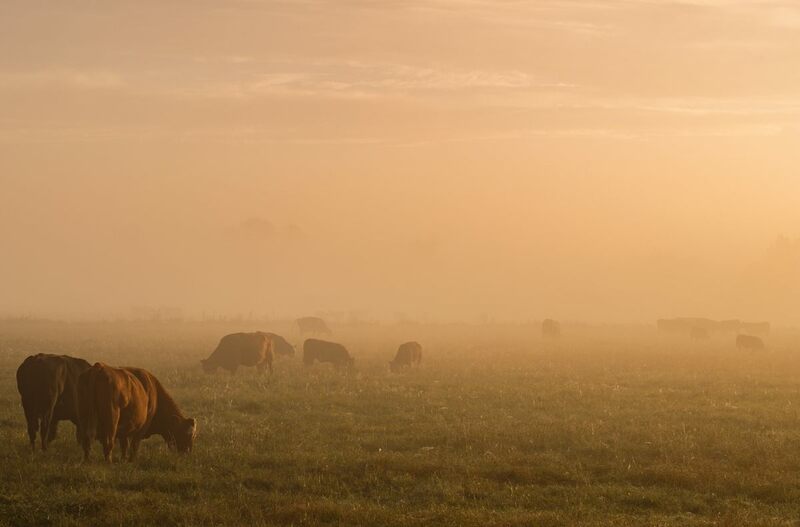 The cattle are grazing, there are clouds in the tall sky above, but the horizon is hidden behind a bank of mist at ground level. There is another image from this early morning shoot here: 1 . 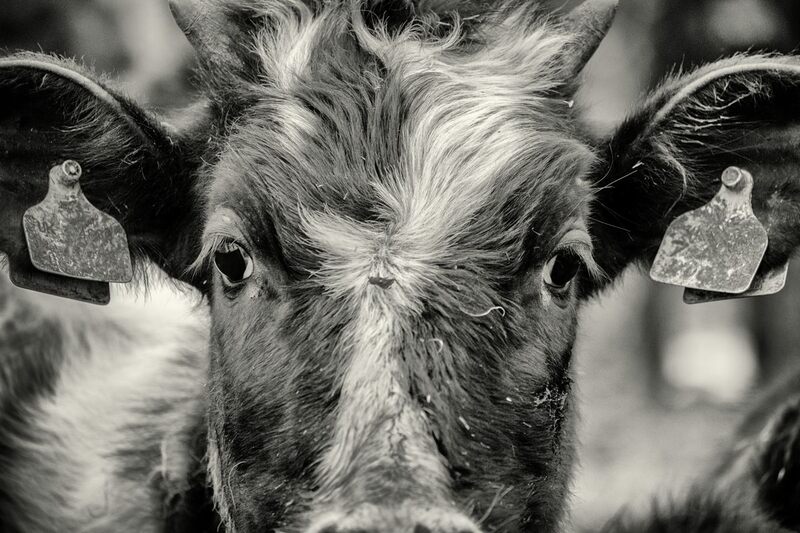 Technique: X-T2 with 55-200 Fujinon lens at 83mm (equiv); 200 ISO; Lightroom, using the Astia/Soft film simulation; Tealham Moor, on the Somerset Levels; 19 Oct 2018. Tadham Moor, looking northwest towards Tealham Moor, on the Somerset Levels; 29 Aug 2013. On the right, Jack’s Drove runs northwards towards the bridge over the North Drain. Droves originated as networks of tracks that enabled farmers to access their fields without crossing those of other farmers. A few of these droves, like the one here, are now tarmac roads, usually single track or nearly so. The trees include many Alders, which thrive in this area’s perpetual wetness. On the left, Willows overhang the rhyne (local dialect for a water-filled ditch; rhymes with “seen”) – they were often planted alongside these waterways to strengthen the banks. 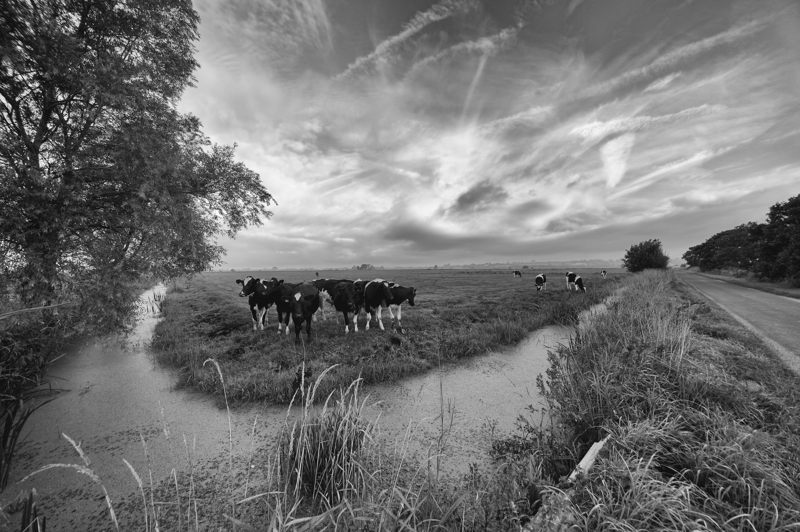 And in the centre, the rhyne curves around the end of a field, at once helping to drain its water and also providing a fenceless barrier – the only fences being very small affairs where the fields’ gates are accessed by little bridges across the rhynes. 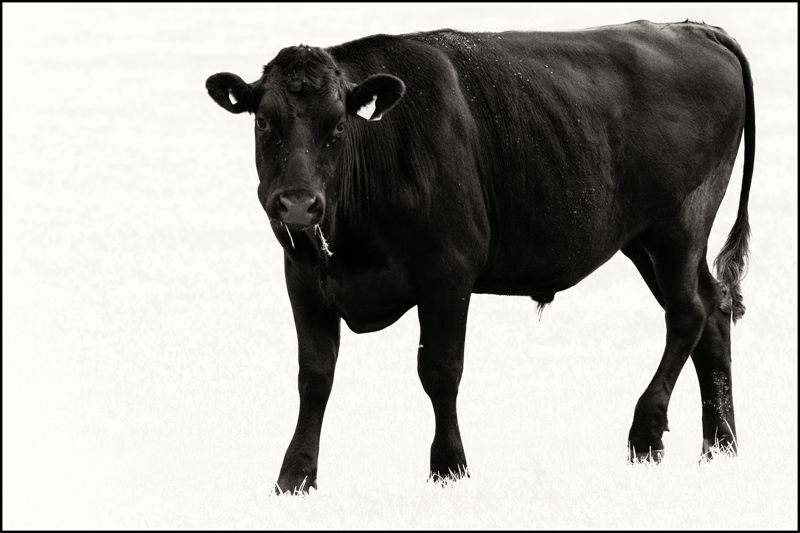 And, finally, the ubiquitous Friesian cattle – curious about this lensman, as always. Technique: D700 with 12-24 Sigma lens at 12mm; 200 ISO; Silver Efex Pro 2, starting with the Full Dynamic Harsh preset. 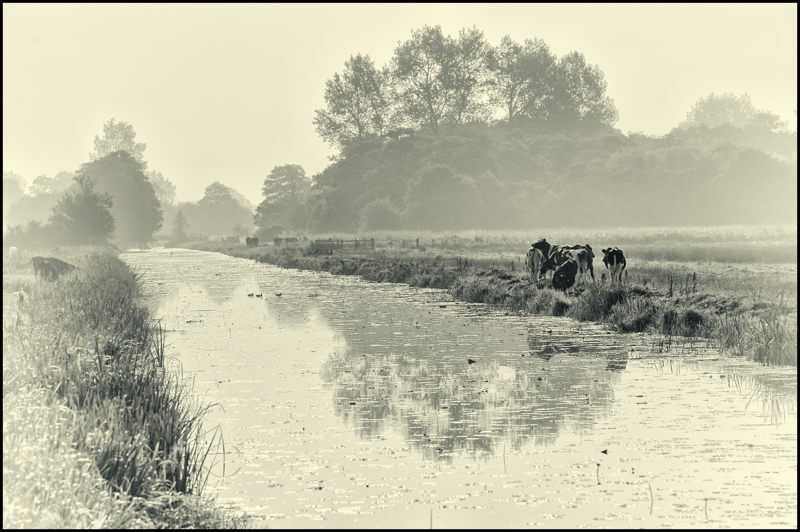 A misty morning along the North Drain, looking east from the Jack’s Drove bridge; the Somerset Levels; 28 Aug 2013. Technique: D700 with 70-300 Nikkor lens at 270mm; 400 ISO; Silver Efex Pro’s High Key 2 preset. Black bullock, finely speckled by some flies, standing on white grass in a field at the bottom of East Water Lane, on the Mendip Hills, Somerset; 7 Aug 2014. When I’m out taking photographs I find that I often forget things, including any ideas that I had beforehand as to the sort of pictures that I’m going out to hopefully capture. It all just goes, and I either get caught up in the moment, photographywise or otherwise – just enjoying the moment – or I’m drifting off into daydreams and other wonders. But SEPs’s infrared presets have been getting to me, and I took some shots up on Mendip recently, with the possibility of IR glimmering, at least dimly, in the back of my mind. I’m not yet going as far as a blogging friend of mine, Lisa Kimmorley, who has had a DSLR modified for IR photography, but I have had thoughts in that direction. Anyway, here is an example of using SEP2 for something like IR effects – a black bullock standing on green grass while chewing something. I had thoughts about trying to clone out the spiky white grass around its hooves, but I’ll never be able to restore the full structure of the hooves and, in any case, I think leaving it as it is adds to the unreality of the scene. Technique: D800 with 70-300 Nikkor lens at 250mm; 200 ISO; Silver Efex Pro 2, starting at the Infrared Film Soft preset. This is a tiny piece of England and, to me, this is simply wonderful. We are here in Stanton Drew, beside a large and important Stone Age monument – and these are the only entry formalities! This is what more of Life should be like!!! 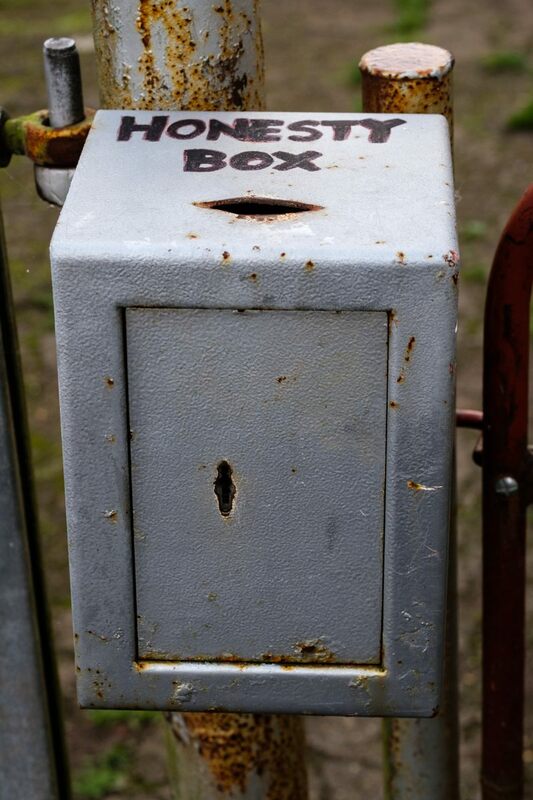 The farmer has attached this box to the gate that takes us into the fields where the prehistoric stones stand, and there is a little hole in the top to receive the one pound entry charge – most people probably pay with a pound coin, a coin that is a little over two centimetres in diameter and which neatly fits through that hole. There is a little keyhole so that the farmer can collect his pounds. And that’s more or less it! 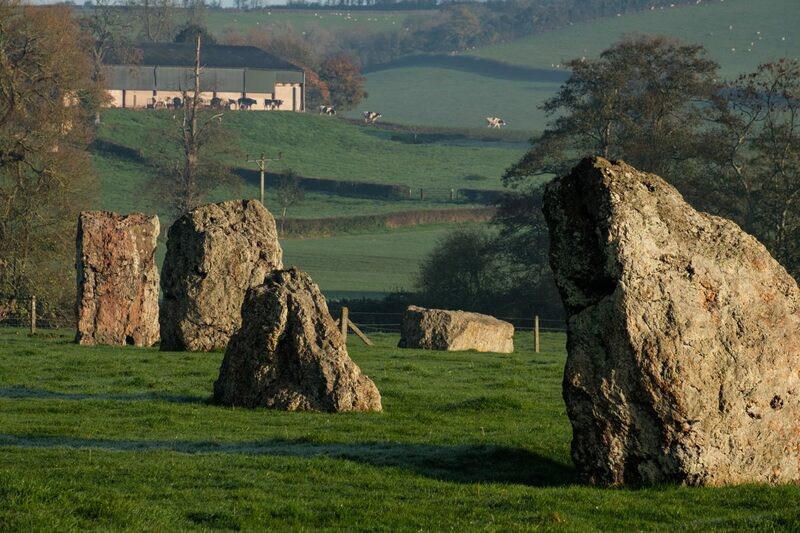 After which you pass through gates which prevent livestock getting out of the fields – and you’re in the fields, and the stones stand, lean and lie wonderfully before you. Part of one of the stone circles, with a farm, cattle and sheep up on the hill behind – click onto the image to better see these. An introduction to this Village Life series can be found here: 1 . Further images are here: 2 3 4 5 6 7 8 9 10 . Each will open in a new window. Click onto each image to open another version in separate window, and click onto that image to enlarge it. Technique: X-T2 with 55-200 Fujinon lens; Lightroom; Stanton Drew; 6 Nov 2017. Looking into misty light, early in the day. You can find other images from this dark and mysterious morning here and here. Technique: X-T2 with 55-200 Fujinon lens at 305mm (equiv); 400 ISO; Lightroom, using the Provia/Standard film simulation; Allerton Moor; 22 Aug 2017. 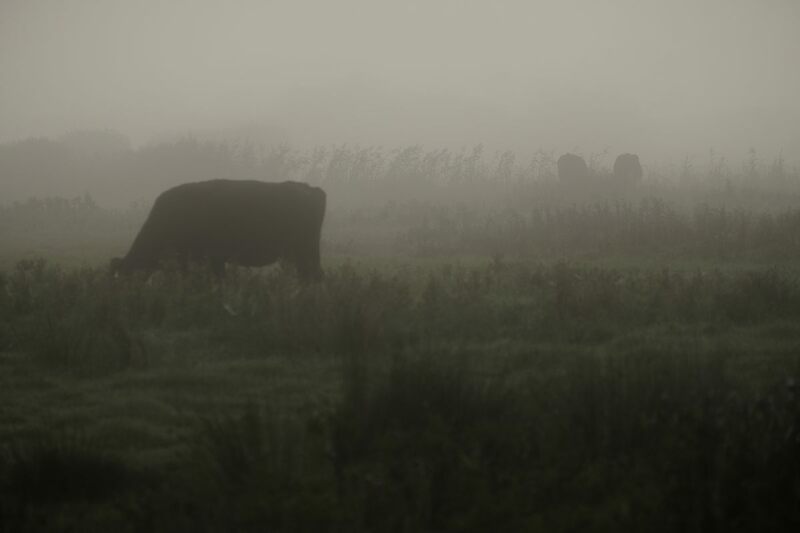 Cows in the mist: early morning on Allerton Moor, west of Chapel Allerton; 22 Aug 2017. Another early visit to these flatlands, with rolling banks of mist looming and vanishing with disconcerting rapidity. Someone had just seen otters in a roadside ditch. 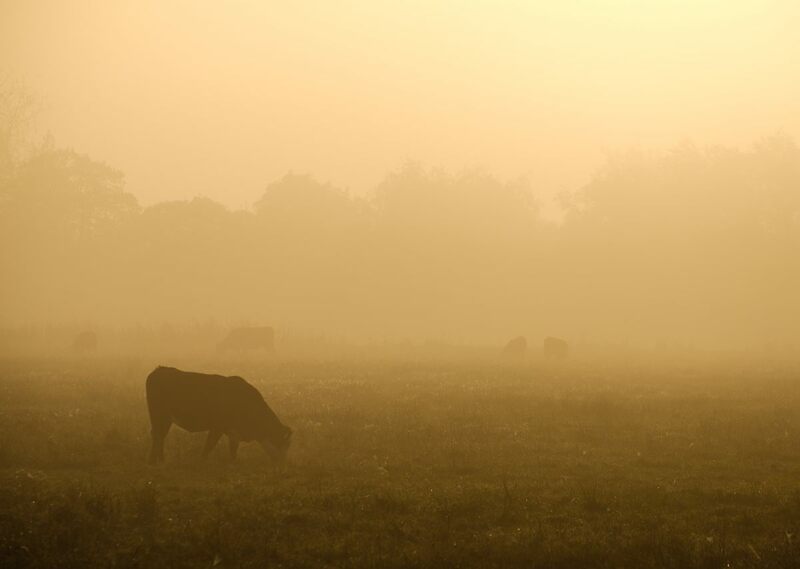 I couldn’t see them but then, driving on towards the village of Mark, cows were grazing in a rough field on my left and there was light seeping uncertainly through the mist. Little colour: this reflects the original scene, and the Pro Neg Hi film simulation helps too. The animal on the left is identifiable, but the two further off could be rocks or some derelict piece of farm machinery. I really enjoy such lighting conditions. I’m heading in towards minor surgery this coming week, and have much to do before I’m temporarily physically curtailed. Hence I’ve not been able to give others’ blogs as much attention as I’d like – apologies for this. Technique: X-T2 with 55-200 Fujinon lens at 305mm (equiv); 400 ISO; Lightroom, using the Pro Neg Hi film simulation.